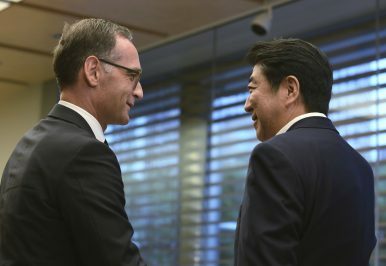 German Foreign Minister Heiko Maas, left, is welcomed by Japanese Prime Minister Shinzo Abe prior to their talks at Abe's official residence in Tokyo (July 25, 2018). Heiko Maas calls for the countries to cooperate against threats from North Korea, Russia, China — and the U.S.
Germany and Japan have the potential to be “at the heart of an alliance of multilateralists” amid “huge upheavals” in the world. That was the message of German Foreign Minister Heiko Maas as he laid out an ambitious vision for closer bilateral cooperation during a visit to Tokyo on July 25. Maas chose Japan as his first Asian destination since being appointed as foreign minister in March. He met with his Japanese counterpart, Taro Kono, for two hours. The meeting came just a week after European leaders and Japanese Prime Minister Shinzo Abe signed a landmark economic partnership agreement, which is to create the largest free trade zone in the world. The agreement was accompanied by a strategic partnership agreement that paves the way for closer coordination between Japan and the European Union on a range of pressing areas. Maas gave a substantive address on his outlook for the bilateral relationship during a speech later in the day to the National Graduate Institute for Policy Studies in Tokyo. Citing examples of the upheavals facing the world, Maas described North Korea’s nuclear and missile tests of the past couple of years as greatly concerning. In Europe, meanwhile, the fighting in eastern Ukraine and refugee flows from Syria and Iraq had “certainly shown us that we do not in fact live in blissful isolation” in Europe. In this context, Maas said, Germany and Japan needed to “stand shoulder to shoulder” because they shared the same values and were “too small to be able to call the shots on their own” on the world stage. assumes responsibility in international organizations together – financially, but also politically. On the trade front, Maas highlighted how the EU-Japan deal had created new standards for global trade in environmental and climate issues, consumer protection, social standards, and competition law. Ongoing negotiations on investment protection arrangements could also result in new standards in this area, Maas said. Maas added, however, that the World Trade Organization needed to be modernized. He suggested Germany and Japan could act as pioneers in developing modern rules for digital trade and for dealing with state enterprises. The minister also suggested trilateral cooperation with the United States, wherever possible, to fight against unfair practices such as the obstacles companies face in accessing markets in China. Trade issues – including the UK’s looming departure from the European Union – topped the agenda for Angela Merkel in Japan.